In my effort to better understand my heritage I read a wide range of book styles and lengths, and I always appreciate a fast, to-the-point, concise read. 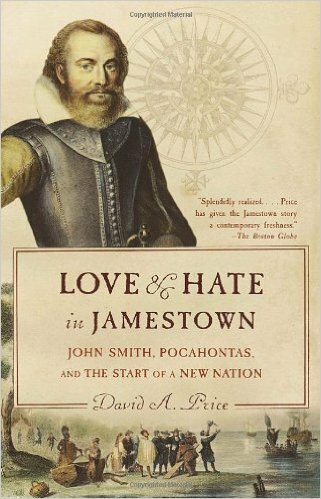 Love and Hate in Jamestown: John Smith, Pocahontas, and the Start of a New Nation by David A. Price fits the bill perfectly. Although I am familiar with the Jamestown story at a bare-bones level, after reading the book I have a much better understanding of all the key players in the British American settlement. Price examines the major disagreements and episodes that defined – and at times – almost destroyed the colony. Jamestown’s history is often romanticized as is Captain John Smith’s rescue by Pocahontas – but Price effectively bypasses this approach and gets down to the essentials. One trait often equated with ‘being American’ is individualism. Ralph Waldo Emerson highlights the trait in Self Reliance. But as Price shows through the various events of Smith’s life, plenty of labels could be attached to Smith. He was a soldier, a planner, an instigator, to name a few, but his most enduring trait was his individualism. This ability to rely on his own skills and intellect led him to the brink of death several times, but it also carved out his rightful place in history. Smith was pragmatic and not idealistic. During the Colony’s era that was grimly named the Starving Time, Smith details his irritation and disdain for the gentlemen class – the bulk of the colonists – by blandly noting the men had resigned themselves to their fate (death) instead of working to survive. This underscores why Smith butts heads with investors back home in London. He quickly tired of the Company’s protocol of sending gentlemen to the colony instead of skilled and unskilled laborers. The colony almost died out because of this policy. Smith not only engaged in manual labor, he went on expeditions, mingled with the natives — learning their languages and customs at a rudimentary level. It was largely through his efforts that the colony survived those first few years. Long ago I tired of the argument that the Founding Fathers believed this or that — or the Constitution says this or that, because the words seem to come from people who have neither read the Constitution nor could name 10 Founding Fathers. Books like Love & Hate – and Albion’s Seed — provide a clearer understanding of America’s beginning. Despite modern politicians and their followers assertions that America was founded on (fill in the blank), in the beginning the British American colonies were filled with a plethora of ideas, philosophies and often contradictory agendas. In Jamestown, the goal of the Virginia Company was gold. It was not religious freedom or democracy. It was simply a business venture complete with advertising and marketing materials that highlighted the good and omitted the bad. When the venture failed to produce a profit and investors were no longer supplying money — the Company began a lottery. Oddly enough, the Jamestown experience was a small blip in Smith’s life – although one he always cherished. After he left the colony in 1609, Smith returned to Britain and over the course of several decades wrote numerous books about New England. He never lost his love for the region – always promoting its merits. His last attempt to come back to North America in 1617 was thwarted by bad weather. He died fourteen years later, in 1631, at the age of 51. 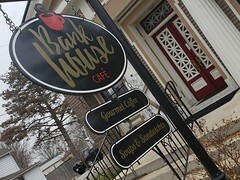 Rated 5 out of 5. This is a nice, quick read filled with the significant episodes of Jamestown’s history. Although the book is heavily researched, the footnotes are not intrusive, and the author includes several pages at the end explaining — and often dispelling — common theories about the Colony. Smith never married and he had no children.